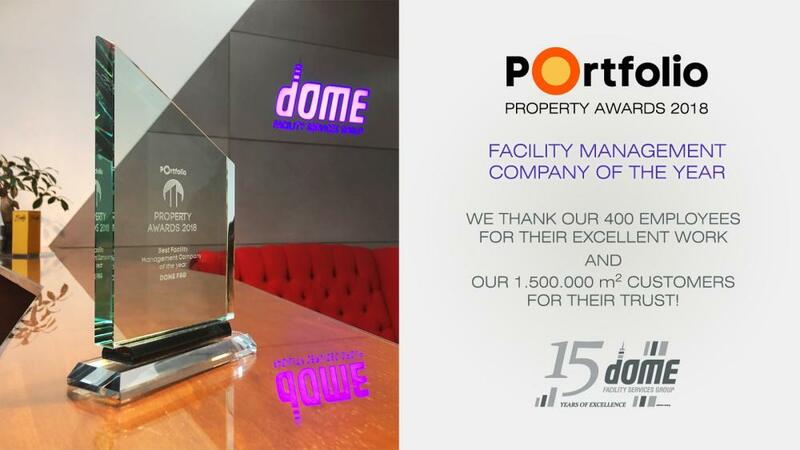 Besides providing high-quality services, the entire leadership of Dome Facility Services Group is committed to meet the requirements of clients and exceed their expectations. In order to provide our services in a quality in line with market requirements, we maintain a quality management system according to ISO 9001: 2015 standard, which was first certified in 2008. As part of our aspiration to ensure environmental protection and work safety, we introduced an integrated management system according to ISO 14001: 2015 and MSZ 28001: 2008 standards. In accordance with our philosophy, the quality management system covers the entire operation of our company, which is based on applying uniform and transparent processes in management and operations, with clearly defined responsibilities and performance indicators. The basis of the system is to define the service level agreed with the clients and contractually undertaken by us, which determines our operational procedures customized for the given client’s demand. Our main operational and service processes are documented in a uniform way; the transparent process descriptions can be measured and monitored by the relevant performance indicators and provide a basis for further opportunities of development. System-wide reports on the company’s administrative and production management applications support the provision of services and the management of corporate functions and supporting areas in an automated manner. The analysis of performance indicators measured weekly, monthly and quarterly allows rapid intervention in case performance indicators show any non-compliance. Systematic management activities include continuous monitoring and improvement of processes. Our internal comparative analyses and the regular knowledge and experience sharing between our experts also contribute to the development of our quality standards and strengthen the quality assurance approach within our organization. Among our business indicators, we place particular emphasis on customer satisfaction. Regular measurement of our clients’ satisfaction at the facility level provides important feedback on the quality of our services. Our highly skilled staff and the activities carried out by the quality assurance departments make a significant contribution to delivering services that exceed our clients’ expectations. In our activities we focus on the expectations of our clients, measuring success with the satisfaction of our customers and judging our performance by the loyalty of our partners. Competitive, high quality performance is the key to achieve our long-term business goals taking into account the needs of our clients, employees, and suppliers. We act thoughtfully and structurally. We go ahead according to plans based on our business strategy, and achieve outstanding results with the quality consciousness and commitment of our managers and colleagues. We actively assist our qualified and pro-active staff. With consistent process orientation, we guarantee that our goals are achieved quickly with optimal resource utilization. Due to our standardized processes, performance indicators and the regular feedback, our decisions are based on facts and strategic orientation. The development of our processes relies on predefined methods and efficient knowledge sharing. We endeavour to reach a strategic partnership with our clients in order to jointly determine the cost-optimized service level tailored to the given request by understanding their business processes and expectations. With our suppliers and subcontractors we build long-lasting business relationships, beneficial for both parties.